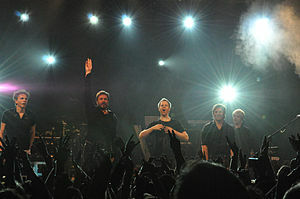 Duran Duran are an English rock band formed in Birmingham in 1978. They were one of the most successful bands of the 1980s and a leading band in the MTV-driven "Second British Invasion" of the United States. Since the 1980s, they have placed 14 singles in the Top 10 of the UK Singles Chart and 21 in the Billboard Hot 100, and according to the Sunday Mercury, they have sold more than 100 million records.